Described as a creative genius and tactical master, David Bronstein was one of the world’s strongest players for a 30-year span. Also a terrific author, Bronstein wrote “Zurich International Chess Tournament 1953”, one of the best chess books written in history. 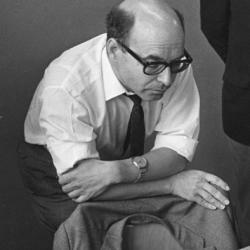 He challenged for the World Championship against Botvinnik, tying the match and narrowly missing out on taking the title. Also a prominent opening theoretician, Bronstein was a player that can be emulated today. David Bronstein learned to play chess at the age of 6. He was trained by an International Master in his home country. He gained the title of Soviet Master at age 16. Instead of going straight into a professional chess career, Bronstein decided to go to university. After studying at the university for a year, he chose to pursue chess more. Known as a rising but unproven player, he played terrifically at the 1945 USSR Championship which gained him notice from other top players. Within a few year he became a Grandmaster and in 1951 Bronstein was able to play against Mikhail Botvinnik for the World Championship, a match that he tied. Despite narrowly missing out on winning the World Championship, he continued to be a force in the chess world throughout the rest of his life, winning many different tournaments. At the end of his life, Bronstein passed away on December 5, 2006.